Despite, all the propaganda against smoking and besides pointing out all the time and over and over that the cigarettes are not only unhealthy, but very dangerous for the health, a lot of people still practice this nasty habit. Also, apart from the direct irreparable damage to the lungs and the respiratory system, smoking can cause a number of additional serious health problems, because, the nature of this habit is that it is, in the majority of the cases, permanent. So, one of the biggest problems of this habit is that the cigarettes create a serious addiction and the cessation of consuming them is very hard and durable process. Apart from the diseases of the breathing system which are provoked directly by smoking, the diseases of the coronary system are also directly linked with inhaling this harmful smoke. Nevertheless, smoking is a frequent factor of risk of getting a lot of other possible health problems. At this point, it is extremely important to emphasize that the non-smokers from the nearby environment are, that way, also under the greater risk of being affected by the same diseases, illnesses, ailment and disorders. What is the passive smoking? So, the main problem is that the secondary inhaled smoke is very dangerous, too, and the passive smokers are endangered without their fault. The latest studies have shown that about 3 thousand of people die of the infarct which is provoked by the secondary smoke. Also, if we consider the general population, the studies show that the active smokers are in the great danger, but they do harm on more than one non-smoker at the time, hence spreading the harmful effect of the cigarette smoke very effectively. Being aware of the mentioned problems related to the habit of smoking and its effect on the environmental air, it is easy to realize that the secondary smokers which most commonly inhale that air are the rest members of the family. At this point, it is important to emphasize that the children are under the greatest danger the cigarette smoke can cause, especially concerning the sensitivity of their respiratory system. Besides the most common mentioned health risks, the secondary smoke is the one of the leading causes of the sudden infant death syndrome. 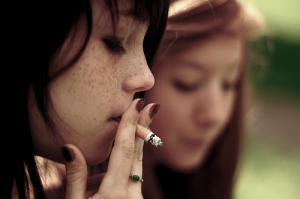 However, as far as the adult passive smokers are concerned, they are most commonly under the greater risk of being affected by the heart and nervous attack, the decreased amount of the good cholesterol in the blood, atherosclerosis, the malignant tumors (especially of the lung) and the chronic obstructive pulmonary disease. Of course, the female part of the population of the passive smokers have a great tendency to suffer from the malignant tumor of the breast, and the pregnant ones are under the greater risk of having a lot of the complications in giving birth. The effect of the third hand smoke (of the harmful substances of it which remain in the environment for a long time) is still being examined.